I wasn’t a huge fan of the first book in this series (see review here) but I found it intriguing and compelling enough to give it another shot. 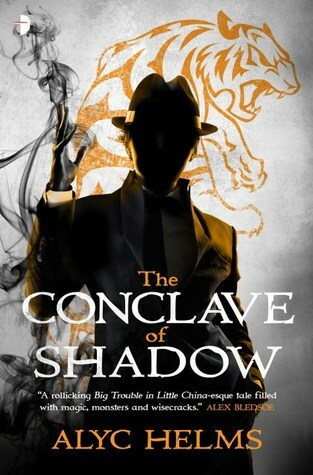 I do think that The Conclave of Shadow steps it up a notch, but is plagued by the same problems that I had with book one. I give author Alyc Helms kudos for going out on a limb and trying something a bit different – even if i doesn’t quite work for me. Missy Masters (also known as the hero Mr. Mystic) has been trying to lay low since her last venture into hero-ing but some secret technology has been stolen from a museum and the balance of power in the shadow realm is shifting. Mr. Mystic is going to need to get involved, but she will find it difficult to tell who her friends are. This book moved much faster for me, but I suspect it’s because I was already aware and prepared for the back-and-forth nature of the narrative as well as the changing gender in our central character. Anyone picking up this book ‘blind’ will likely struggle with understanding that Missy Master is also Mr. Mystic and when she is he, he is referred to as a male. Once this premise is accepted … and understood … then the reader is able to get in to the story itself. Helms combines pulp super-heroics with Asian martial arts and a fantasy-oriented ‘Shadow Realm.’ It is ambitious and the action moves along splendidly. And still … I can’t quite get in to this. Everything about this book appears to be directed right at me. I love the old action/superhero pulps, Oriental mysticism, and alternate world fantasy. So why don’t I take to this more? I don’t know. I never draw a real strong relationship with Missy Masters. I’m never truly in her corner, rooting for her to succeed, and that’s clearly a problem when the focus is so strongly on one individual over-coming certain odds. And perhaps that is what this comes down to – uncertainty about whether this is a story of a character overcoming odds, or an adventure story featuring a particular character. There is a difference which isn’t clear here to me. I still rank this slightly above average and would read another, but this certainly isn’t a shout-out recommendation. Looking for a good book? The Conclave of Shadow by Alyc Helm is a fast-paced, but sometimes confusing, adventure in the tradition of the classic pulps, laced with mysticism and fantasy.